Local POS software for local retail businesses | A blog about smart POS software for independent small businesses. We have seen another example in the last week how offshore web development can be bad for a small retail business. The delivered site was incomplete. Parts of the requirements of the business had not been met. Links were broken. For example, the link to a gallery of products took the browser nowhere. The colour schemes of the business were not adhered to throughout the site. The developer failed to deliver the payment gateway integrations required. The web developer stopped taking calls, demanding contact was by email – because they did not want to be woken at night. Spelling of some words was changed to American spelling because that is what the web developer thought was right compared to Australian spelling. The site was not setup correctly to receive images and inventory data from the POS software. The site was delivered weeks late. When it comes to web development you get what you pay for. Low cost offshore web development is low cost because of lower labour rates and, often, because of corners cut. 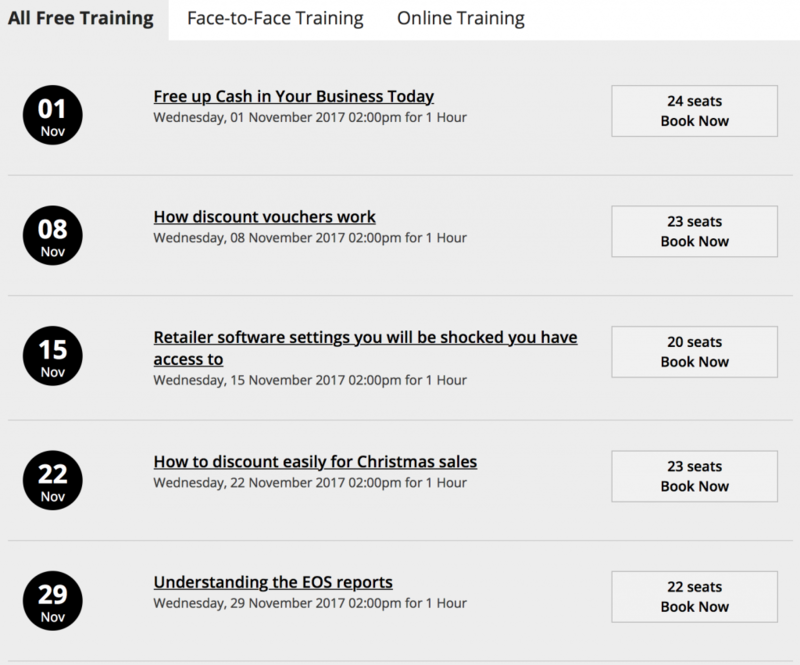 We have announced details of our free live online POS software training workshops for small business retailers. Access for any of our customers is free. We pay for the call to connect them in on their phone, anywhere. We have expanded class size due to demand. When a retail business owner enquires about our software for their business we visit with them, to look at their business and see whether our specialty POS software is a good fit for them. There is no substitute for being in a business to determine if their business and ours fit together. Since a POS software investment is a long-term relationship it is important to ensure the fit is good. On a recent country trip visiting retailers, one of our team took this photo from their car. 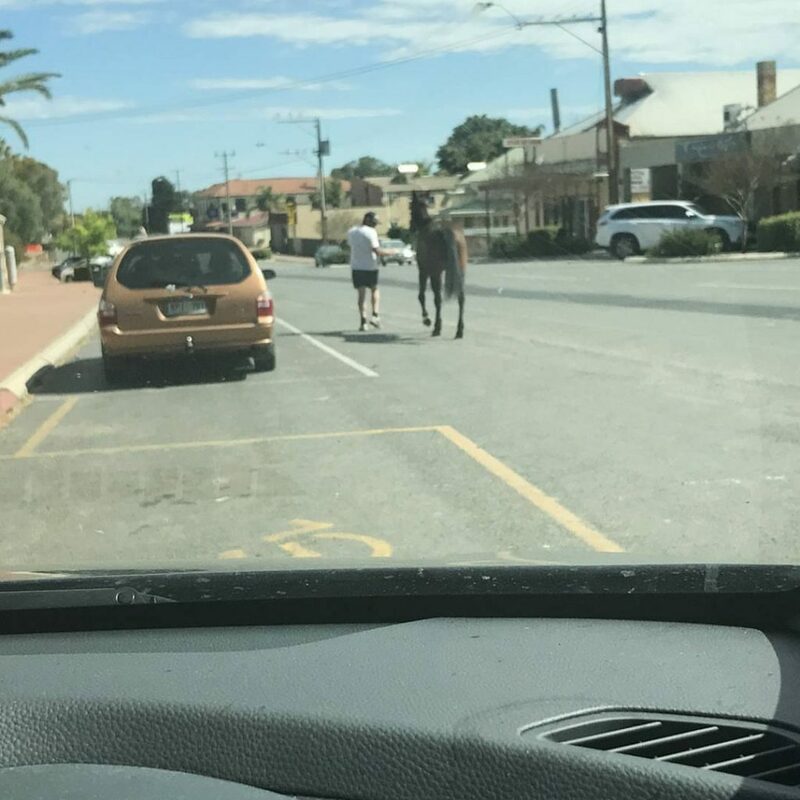 You know you’re in the country when someone is walking their horse to the local pet store! A small competitor of ours, POS Solutions, is paying Google to have their ad placed in the search results when people search for us. You can tell it is a paid ad because of the AD box next to their listing. Each time someone clicks on the ad, it costs POS Solutions money. This year we have switched plenty more customers from POS Solutions to us. 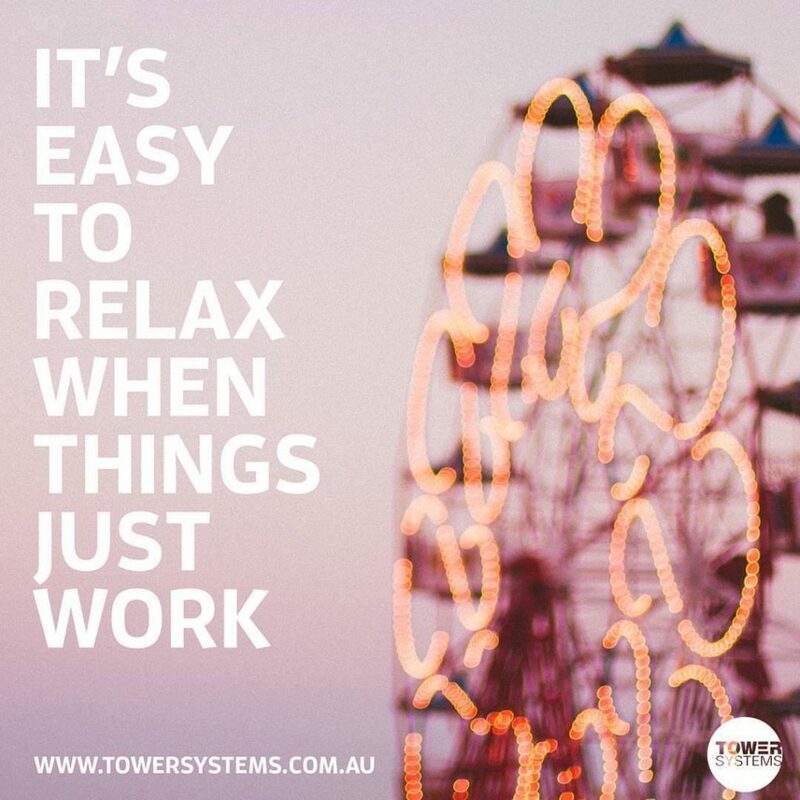 Tower Systems is proud to offer personal business website development in-house in addition to supplying fantastic POS software for specialty retailers. All of our websites are developed in Australia. Our websites are connected to our POS software. We offer POS software connected websites for a range of ecommerce platforms including the best of the best: Shopify, Magento and WooCommerce. 99% of small business retail needs are served through these sites. Our websites are beautiful shopper-friendly, ready to transact, easily found on Google and ideal for helping small business retailers to leverage online opportunities. When it comes to web development, you get what you pay for. Saving money may not be as good as it first seems as it could be that the saving is achieved by using an offshore web developer who is only available at certain times and who does not understand the social and commercial situation in which your business operates. Our web development skills are so diverse and mature that we are confident we can develop a website for any type of business, not just retailers. We have experience in comprehensive integrations, shipping methods, payment methods, foreign currency and more. This ensures we bring to the opportunity a broad skill set on which a retail business can rely. We are proud to help small business retailers run more successful and efficient businesses, in-store and online, through multi-skilled technicians creating easy to use software that is backed by accessible friendly support. This is the Tower Systems advantage. Retailers switching from one POS software program to another usually want to convert their business data. Rather than saying yes this can be done, our approach is to provide our customers with advice on what can be done and what cannot be done and to explain the processes and the whys. Converting data from your current software eliminates the need to manually key data into the Tower software. The time saving is considerable. If the current data is good data, the value of bringing that across can be vital to any business. Converted data is only as good as the source data. In other words, if the data in your current system is of poor quality, the quality will not improve in the converted data – unless you clean up the current data prior to conversion. Delete all stock items you no longer carry and will not carry in the future. Delete all customers you have not served in more than five years. Delete all supplier details where you no longer deal with the supplier. What we convert depends on the software we are converting from. Some software is restrictive, to lock you into it while other software calculates data such as loyalty points live, rather than storing a number by customer. Customer details. Name, address, phone, email. Supplier details. Name, address, phone, email. Inventory. Description, stock code, bar code, quantity on hand, department, category and supplier. Loyalty. Name. ID code / number and points value. The best way to be prepared for and certain about a conversion is a pre-conversion check. To do this we would need full access to your data well before the installation. This check will help us see any issues and either resolve them or raise them with you prior to the actual conversion. This check is done at our head office by a senior member of our team. We will advise you of any issues we encounter during the per conversion check. This is done either on site or at our office during or immediately prior to the installation process as it must be done using up to date data as you switch from one system to another. The conversion is at a moment in time. In other words, you cannot flip from system to system if you want to have accurate data. Once converted, you are on the new system. Conversions can take considerable time, overnight, or even longer than a day, depending on the amount of data to convert. Therefore, we encourage you to clean up your data prior to the conversion. Once the conversion is done and you are advised it is complete it will be important you check the converted data. Check customers, balances, points and other data to ensure you are confident the data you need has been converted. We say we don’t know what we don’t know as it is true. You know your data better than us, you are better positioned to see mistakes we might otherwise miss – hence our reliance on you checking the converted data. Once you have the converted data in our software and are happy with it, you will be advised to run a go live. This sees you enter up-to-date account balances. No line items are entered, only the balance. It is important we know if you want data converted when you order your system from us. We are unable to do the work if it is requested during the installation as we have allocated time for the installation and training only, not for conversion. It is difficult hearing an adult cry on the other end of the phone when you pick up the call expecting it to be a regular business to business discussion. This time was different. Their story was one of hurt and pain, considerable financial hurt and considerable personal pain. They were distressed. They did not see how they could go on with business, they were so upset. Our job in the call was to empathise and support, to not judge and to help them navigate next steps in what was a complex and unexpected situation. The person on the other end of the phone was a retailer using our POS software. They called because they had just discovered an employee theft situation. While they knew they had tools in their POS software for early intervention on employee theft, they had not used them, until now, following a suspicion. It turned out their suspicion was wrong. The person stealing from them was their most trusted employee, a family friend. The first few calls with the customer about this were about them, about our customer, helping them navigate their own distress, so they could continue to function, to keep their business going, while they did what was necessary to have the theft dealt with formally by the authorities. In addition to structured advice on handling any discovered employee theft, we provide help and support personally for the business owner, to help them personally deal with the violation they feel because of the theft. We help the business owner(s) personally in several ways. These including pointing them to professional counselling services, physically being with them in the business when taking steps to deal with the theft, doing independent research on the theft so the authorities have the evidence they will need, being a pillar of support and strength for the retailer, ensuring they know we have their back and that how they feel right now will pass as they step through dealing with this. While we are not professionally trained counsellors, we have been involved is supporting retailers from many different businesses in navigating the discovery and management of employee theft. We take care to support the person first, to ensure they are okay and reinforce that they will be okay. We help them as they pass through emotions ranging from hurt, anger, despair and hate. We take their hand and offer ourselves as a pillar of strength. We do this because we have been there ourselves, in our own retail businesses over the years. We draw on our own experiences as we find this helps. If you are new to owning or running a retail business it is likely that you have been too busy opening the business and settling in to have time to pay attention to basic advice about running the business. Business consultants and others who advise business owners, too, often get caught up in big picture strategies and themes to deal with the basics. We have grouped the advice into business areas. Driving shopper efficiency is key for retailers. It is easier to get a shopper in the store to purchase more than to get a new shopper into the store from outside. In looking at shopper basket efficiency for many different retail businesses we have developed an understanding of basic steps different small business retailers can take to drive shipper efficiency. Here is our advice. Smile, make conversation, treasure your customers. The more they enjoy shopping in your shop the more they will shop in your shop. Smile. Get good eye contact. Say hello rather than can I help you. The more personal the experience the more they will remember you. This is your point of difference. Personal service is the single most valuable way to drive shopper visit efficiency. Standing behind the counter means you’ll serve people who come to you. The more you are in the body of the shop and engaging with customers the more they will buy. In busy times work the shop – engage, offer up sells. Customer service increases revenue in every situation we have seen. Our advice is you locate a workstation on the shop floor. Show how products are used. THE COUNTER AS A SALES TOOL. Go to your shop counter and look at it from a customer perspective. What’s the message? Is it inviting? Are you using the counter to drive sales? Anyone can put product at their counter. It takes a clever retailer to use the counter to entice customers to buy a product. Use your counter wisely. It’s difficult to offer every customer an up sell. Instead, use your receipts. Include a $$ off on next purchase. Point it out. Keep it simple, have an expiry date on the coupon. This is an easy win that will bring back shoppers for sure. Get your employees on side – explain your focus on growth. If they don’t support you, replace them. Respect your employees and ask for their ideas. Use their ideas! Train them. Guide them in providing exceptional service. They are your front line and need to be your most skilled team members. Keep track of your success and failures. Be realistic in your assessment. Change what is not working and celebrate what is working – keeping your employees informed all the way through the process. Focus on your top, say, 5 items. Watch where people buying these items go in your shop. Watch carefully. Consider what you can do to get them elsewhere in your shop. This is the key – getting people to shop outside their usual category, breaking their habits. In your busiest time in the week bring in a spruiker for use INSIDE your shop. Create some buzz and excitement to draw people away from their usual shopping areas. A key reason people will stop visiting your shop is that they know what it will be like. A changing shop can be exciting. Good changes will make people want to come in and check out new products and other changes you’ve made. While much of this advice reads like common sense. Too often we see retailers who have missed the opportunity. What should a small business retailer ask a POS software company as part of your process of considering whether to use their software? The important part of this question is small business retailer. What small business retailers need differs to what big business retailers need. What may look good in a video or an online pitch may not be good when you need help or a specific facility or access to an integration to help you grow your business. Beyond the functionality of the POS software itself there are questions you can ask that could inform a better business decision on what is right for a business. To help you think about possible questions, we have put together twenty-six for your consideration. Read through these and start to think about questions that could be useful for you. The answers to these questions will better inform you, they will help separate software companies you are considering. The answers will help you see the software company that is a better fit for your specific business today. Take your time. The right software company will be a long-term partner of your business. Will you come my business to assess my needs? Will you come to my business and demonstrate your software? If you know your software is not a good fit for my business will you say so? Is the software developed in Australia? Is your help desk based in Australia? Are you selling software you developed yourselves? Can you convert data from other software? Do you sell to big businesses, 25 shops or more? Does your software link with Xero, MYOB & Quicken? Can I access your software from home and elsewhere? Do you own and run retail businesses as test sites? Can I connect your software to a website? Do you develop websites I can connect to? If you develop websites are the main platforms of Magento, Shopify or WooCommerce? Can I lease your software? Can I purchase your software outright? Is your software designed specifically for my retail channel? Will you train me on your software in my business? Will you train my staff in how to use the software? Is software support included for the first year? Do you charge to help me uncover employee theft? Do you charge to assess the performance of my business? Do I have to buy my hardware from you? If your year-on-year sales are not down in your retail business, this advice is not for you. If your year-on-year sales are down, something must change if you want to turn the situation around, please read on. Sometimes, when we are asked by retailers how to deal with a year on year sales decline, our suggestions are not taken up and the business keeps doing what it was doing. In doing this, the declining trend will continue. We appreciate it can be challenging looking outside of the fog of declining sales and worsening business performance numbers. However, if you cannot reach out beyond this fog the survival of the business is at risk. If you keep doing what you have been doing, the sales results in your business will be what they have been, the trend is unlikely to change. It would be a mistake to think that external factors are the sole reason your sales are down. So, change is necessary – change in what you sell, how you merchandise and how you promote. It is only from change that the sales decline could be arrested and reversed. Our advice is to look for u-turn or right turn opportunities, changes you can implement to divert you from your current path. Suggesting such changes is something we can do through looking at your business performance data for you. Ask us to challenge you. We will first ask to see your year on year data at a detailed level as this will reveal the truth of the situation and from there we can develop change suggestions for your consideration. Why ask a POS software company? We see data from many different businesses. That perspective can help. We are retailers too and have been for decades. That provides a body of experiences on which we can draw in considering advice we can provide. We will gladly leverage our experiences to help in any situation. We don’t have all the answers, we will even suggest ideas we later discover are mistakes. However, doing what you have been doing in a situation of declining sales is a bigger mistake. Tower Systems is proud to be the Platinum sponsor of PIAA trade show that opens today in Sydney. We are grateful for the opportunity to support the industry and pet retailers in this way. 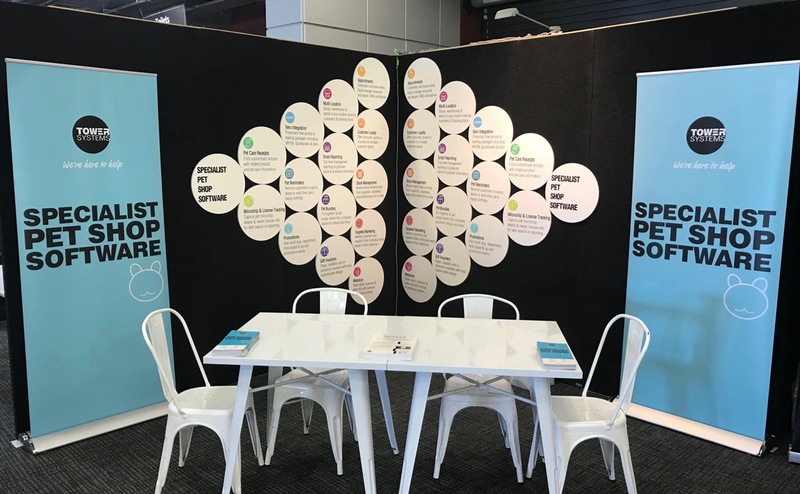 In addition to our platinum sponsorship of the event, speaking at workshops and other engagement, we have terrific stand showing off beautiful, best-practice, pet shop software. Age restricted products are a risk for small business retailers in that regulations are tight and penalties for selling to underage shoppers considerable, including the potential loss of right to sell age restricted products. While it may sound simple to say that this product or that product cannot be sold to someone below a certain age, without the right forced checks and balances mistakenly doing just that is relatively easy. Our advice to small business retailers selling age restricted products is that they implement appropriate barrier checks and balanced in their POS software to ensure that their age restricted product approach is best practice. Use your POS software to fore an age check on every purchase. This shows the business having zero tolerance for avoiding the age check. Regularly remind staff about this. Do these things and any violation the retail sales person deliberately violating business policy and defrauding the business in their use of the age check facilities in the POS software. These steps can help should the business be caught serving an underage customer. You can prove the processes were black and white and that the server needed to lie to the ach check barrier in the POS software for the transaction to proceed. Retailers can decide for themselves which products have age check and which do not. This should be reviewed regularly to ensure it is up to date, to ensure that the right checks and balances are in place to show the business is meeting all regulatory age check obligations. Get your age check processes right from the outset and you can layer the business with a level of protection that is vital. For sure, there is an operational delay in selling age restricted products, but this is minor when you consider the cost to the business of being caught breaking the law in this space. Our advice to retailers is that they use the age restriction facilities in their POS software to ensure that they get it right, every time. In our work, we deal with the issues of age restricted products in a range of retail channels including: newsagencies, firearms retail, produce stores and adult stores. In each case, there are different regulations and requirements to handle. We are thrilled to have selected a candidate for a new help desk role. Our new colleague will join us in a couple of weeks. Photos are very important to retailers who sell online. The better the photos of a product the easier it is for an online shopper to purchase. This is tough small business retailers as they often need to photograph products themselves if they want photos that look different from the stock photos provided by suppliers. Photography for online sales is different to personal photography. We get involved in this as it is in our POS software where small business retailers store photos and other content for each product they wish to sell online. Having the one repository for inventory information and images is important. It assists management and provided ease of change should the need arise. The right place for photography that is setup for easy access. Props for posing photos as the more you can show how a product might be used the better in some circumstances. A lightbox for taking shadowless photos. This should take different background colours and bet of the right size for the types of products you are likely to need to photograph. A good camera. A current model smart phone is usually okay given the quality of the cameras they offer today. Basic editing software for correcting any imperfections than cannot be easily fixed by taking another photo. Photo guidelines for all product photos taken by the business, so there is a consistent aesthetic for photos used by the business. Once photos are taken and the actual ones to be used have been selected, these are loaded into the POS software for use there and for feeding to any ecommerce site used by the business. If there are bulk photos to be uploaded to an ecommerce site, there are easy ways to do this without having to go through the POS software if that is a preference. While none of this is related directly to help desk support using our POS software, we happily get involved, sharing the expertise of our team gained from our own retail businesses and the various ecommerce sites with which they connect. Another of our customers had their business severely impacted last week with their new National Broadband Network (NBN) connection taking almost the whole week to get up and running. You would think this would be okay, that they could use their old non NBN internet connection until the NBN was up and running. That smart approach was not the approach those providing their NBN connection facilitated. At the start of the week their service provider disconnected their internet access as the NBN was about to be turned on. Five days later, after many phone calls and extraordinary business disruption, the NBN was on. There was no apology, no compensation, no empathy. This small business was hit hard by not having internet access. They had to spend money on temporary arrangements, which were mediocre at best. Given their location that not only cost money, it also cost time to organise. The poor handling of the NBN roll out was caused by the Internet Service Provider of the small business. This is where the poor customer experience occurred with them disconnecting internet access prior turning NBN on and then compounding the problem with poor, almost non-existent, customer service. There were products the business could not sell over the counter, payments they could not take, services they could not provide. Yet their ISP did not help. The biggest challenge was with cash as this business relied on close to half all transactions being cashless and they lost that, without warning, when their ISP cut them off without warning because of the imminent NBN switch over. The agreed plan was switch one off and switch one on. The operational people at the ISP were not told of the agreed plan and once they switched internet access off it appeared to be too hard to switch back on. We helped where we could with options on lodging a complaint against their ISP and with alternative access options they could acquire. But none of this should have been necessary. Their ISP, which claims to support small local businesses, should have had the entire matter in hand. While there is a quality issue with the current version of the NBN roll out in our opinion, there is this other problem of poor ISP management of business cut over from existing internet access to NBN access. It should be easy, well managed with easy access contact points in the event of any issue. Internet access is vitally important infrastructure in small business retail today. This switching over to NBN must be better, faster, for small business retail. More Australian banks are pulling out of country towns, leaving local businesses and individuals without any over the counter bank services. In one situation last week, a regional town with a population of 2,000 saw its last bank brand close, leaving locals a forty-five-minute drive to the nearest bank. This means local businesses have a round trip of ninety minutes just to bank business takings, increasing business costs by hundreds of dollars a week as banking, which used to be done locally daily, now must be done three times a week resulting in four and a half hours in the can and at least another hour and a half parking, waiting and more. It impacts on how a business operates. While some businesses can operate by promoting cashless trading, in regional and rural towns with an older demographic, cash is preferred. In not banking every day, small business retailers carry more cash on their premises. This increases the risk of theft. Insurance company representatives have said this could result in higher premiums. The costs resulting from banks reducing their level of customer service cascade, hurting further these vulnerable local businesses that matter to their small local communities. With more than half of our small business POS software customers in regional and rural Australia, matters such as the closure of local bank branches and agencies matters to us, because it matters to our customers. It is possible that a local bank closure is enough to tip a local business owner to closing their business. The knock-on effect on local jobs, local suppliers and out of town suppliers like us would be noticed. We think there is a role for government here to offer an operating cost subsidy to banks that maintain regional and rural banks in towns with a lower than agreed population threshold. We think such a policy would not only help small businesses like our clients, it would improve the appeal of the town for new residents as well as improving security for those who use the bank. Locally owned small business retail is vital in any situation, but more so in regional and rural towns. The retreat by banks is an operational challenge that disadvantages regional and rural Australia and this is bad for the economy. Tower Systems actively supports calls by small business retailers for government action to provide support for local banking services. Access vital performance data about your small b business anywhere, anytime. Our POS software system is very configurable. Users have the ability, if they wish, to run without being hosted. This solves any Internet stability questions, particularly for rural/regional Australian where this may be an issue. The other challenge with cloud is the costs. Our experience is some small business owners are not happy with the monthly hosting cost for a cloud service. However, the customer can choose the approach that is best for their specific circumstances. Alternatively, if users want, we can host the system in the cloud, 100% in the cloud. This can be hosted on our secure dedicated infrastructure (additional costs will apply) or on infrastructure of their choosing. We will provide guidance on the configuration so the ideal environment is created. If the user runs in a hosted environment and the internet drops out the user can switch to a facility we call Outpost Mode. OUTPOST mode allows for basic trading, scanning sales, until such time as Internet access is restored. The level of software access in the event of internet access being down, blocked or otherwise hampered does depend on choices made by the customer. Our customers can be secure in the knowledge that we support multiple choices, we make it easy for them transact if that is the core goal of their business. Can you continue to trade if the internet is down? Yes! Planning ahead of any incident or disaster is important in our view. 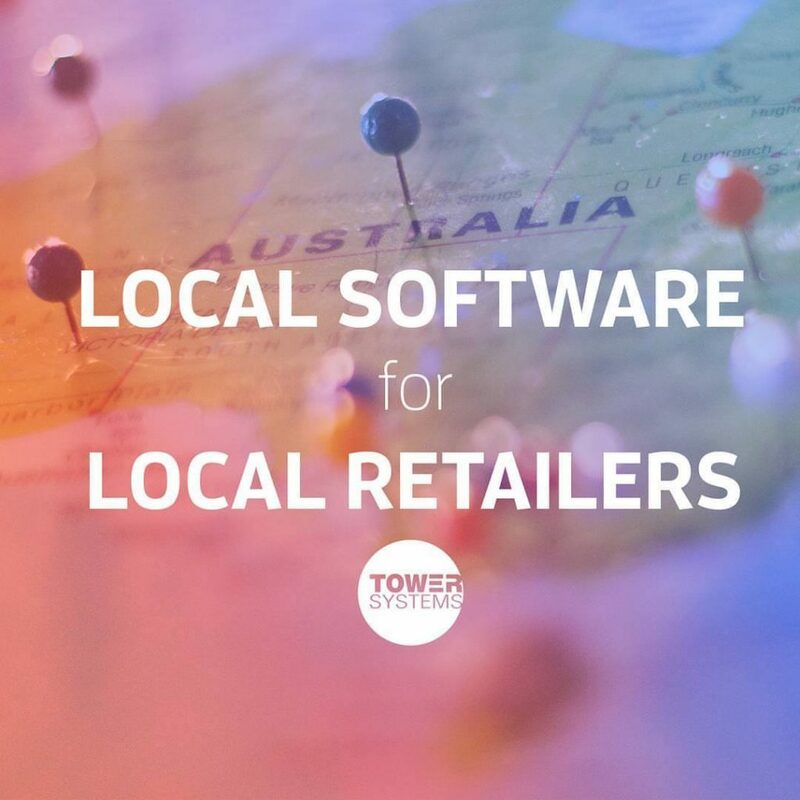 The latest fishing shop software from Tower Systems has terrific tools for fishing ships as well as bait and tackle businesses, outdoors businesses, camping goods stores and related businesses. Used in many business locations already, our software is well-established and much appreciated. These existing customers are playing a vital role in helping to guide enhancements too, to ensure we serve evolving needs in the marketplace. Fishing and outdoors shops have unique needs. Your business is personal. You need a software company committed to serving you and committed to helping you more efficiently transact with your suppliers. From the sales counter to the back room, our Fishing and Outdoors Shop Software is fit for purpose. It is not everyday POS software. No, this is Fishing and Outdoors Shop Software – designed with and for these types of businesses. We come to your business, install the software and train you and your staff, face to face, jargon free. We provide personal support as you settle in. yes, our service is personal, just as the service is in fishing related businesses themselves. There are many ways you can use this software to help you personalise the shopping experience that make comparing your business to others difficult. Good data easily accessed guides better business decisions – we see this every day in our work with small business retailers. How we handle a support call from a small business user of o0ur POS software is a differentiator for us and for our customers. Customer calls, emails, logs request for help through our website or our software. The call is immediately logged into our CRM system. The call often handled immediately, with the answer provided. If appropriate, the client site is accessed, with permission of the client. Advice is provided or other work done to fix the issue. A call close email is sent with a summary of the assistance provided, so the client can confirm that this did in fact fix the query. A second of the call is placed on the client digital file, for future reference. A random num bee of calls are peer-reviewed to ensure best practice is followed. A random selection of support alls are followed up for a customer happiness check. All through the process, no matter how long or how short, our service is personal. Real people. Real names. 100% based in Australia. Customer service is vital for small business retailers when considering POS software for their businesses. We understand that. We recourse our team to be able to deliver quality customer service as and when customers want it. We call what we do the Tower AdvantageTM. It is a differentiator for us and we love it. We think our customers do too.